In 1878, Francis Russell, the 9th Duke of Bedford, fell in love with a house. The incident happened as he walked through the ‘Streets of Nations’: an ambitious exhibition showcasing domestic architecture from across the globe. Belonging to the wider ‘Exposition Universelle’ – Paris’ glittering display of engineering and architectural marvels – the ‘Streets of Nations’ was the exhibition’s crowning triumph: a boulevard featuring entire houses, created and shipped in exclusively for the big event. It seems the sort of thing that Kevin McCloud might like. After strolling past many houses, Francis came to a halt outside a mock-Tudor home. With thick black timbers and delicate lead-lined windows, his heart skipped a beat. That this large house was sat in the middle of an exhibition hall in Paris, was apparently no problem for this architectural connoisseur. He was too busy imagining how the house might look on his estate in Bedfordshire, surrounded by his prized deer. And so it was that somehow Francis’ beloved house was dismantled – bolt by bolt – and shipped across the channel to his lordly estate in Woburn. You wonder how much he paid in postage and packaging. After reassembling the house – an IKEA-inspired nightmare – his home was finally finished: a little piece of Paris in a very English garden. Having grown up in the area, Paris House was a place that I’d heard of, but until one bright Sunday morning, never visited. Driving through the enormous stone arch that marks the entrance to the Woburn estate, I wondered what had taken me so long. It was a freezing cold morning – with winter making its sudden appearance in and among the frozen leaves and acres of fields that stretched out in front of me. Driving down the frozen road towards the house, I spotted two stags stood nonchalantly by the side of the road, eyeballing me suspiciously. 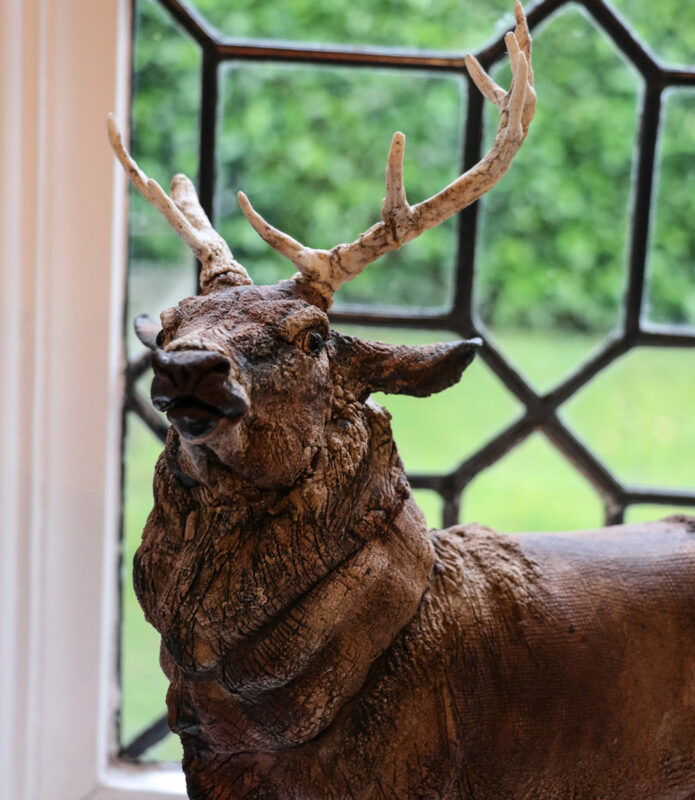 These are the real heirs of Woburn – the stock of endless generations of deer that have inhabited the estate since 1661. Eventually, as I neared the bottom of the drive, I spotted the infamous House. ‘Bonjour’, I thought – gazing at the incredibly beautiful building in front of me. Climbing out my car whilst I waited for Claire (she later came flying down the road, apparently oblivious to the resident deer) I was excited to start our day. 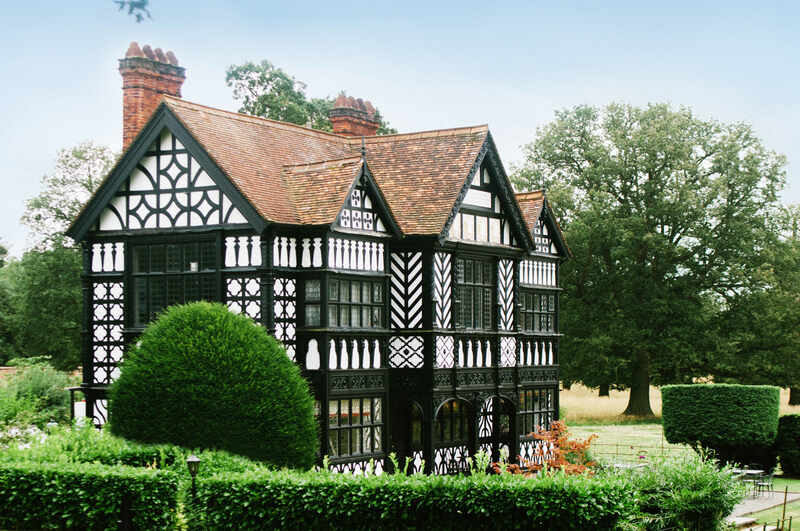 You see, Paris House is no longer home to an ambitious Duke with a penchant for mock-Tudor architecture, but a renowned restaurant, owned by Phil Fanning and his wife. 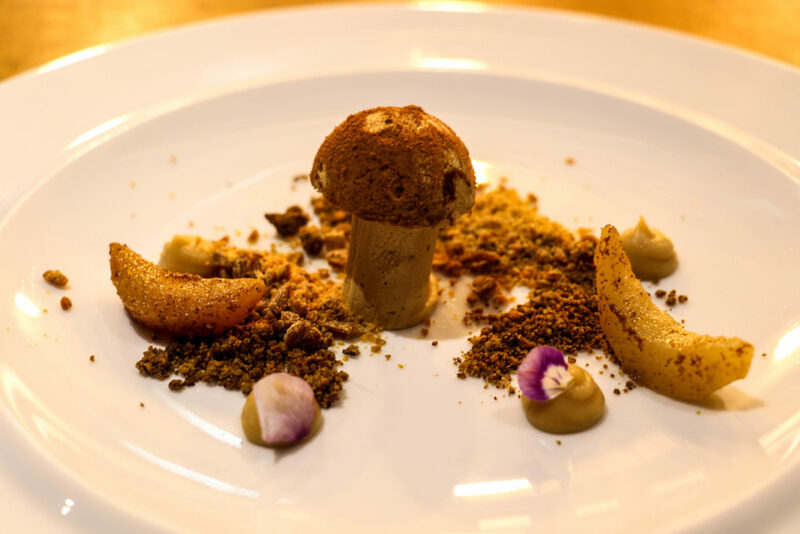 These days, the rooms of Paris House are filled with a small number of lucky diners, enjoying the incredible blend of surprising flavours that Phil and his team devise. Today, Claire and I would be two of these lucky diners, here to try one of Paris House’s ‘Masterclasses’, before sitting down at the chef’s table to enjoy a six course tasting menu. We had a long and difficult day ahead of us. Walking up to the pretty wooden porch and ringing the bell, I wondered how this little house had enjoyed its time in England so far. Since arriving on the Duke’s estate, it had been a hospital – fondly known as the ‘tonsil hospital’. It had welcomed royal visitors and even General de Gaulle, before passing hands to a pilot who saved the 11th Duke of Bedford’s wife, Mary, in a plane crash, somewhere in the desert. Later, Mary – also known as the ‘High-Flying Duchess’, would take off from the Woburn estate in her plane, never to return; lost somewhere in the North Sea. The pilot left Paris House and for a while it had no real purpose. However, in 2010, Paris House reopened, this time as an award-winning restaurant.Walking through the entrance – met by a pot of tea and a plate of freshly baked cookies, I was glad that the house had finally found its calling. After pouring ourselves some tea and meeting our fellow chefs for the day, we met Phil – the Executive Chef and now owner of Paris House. 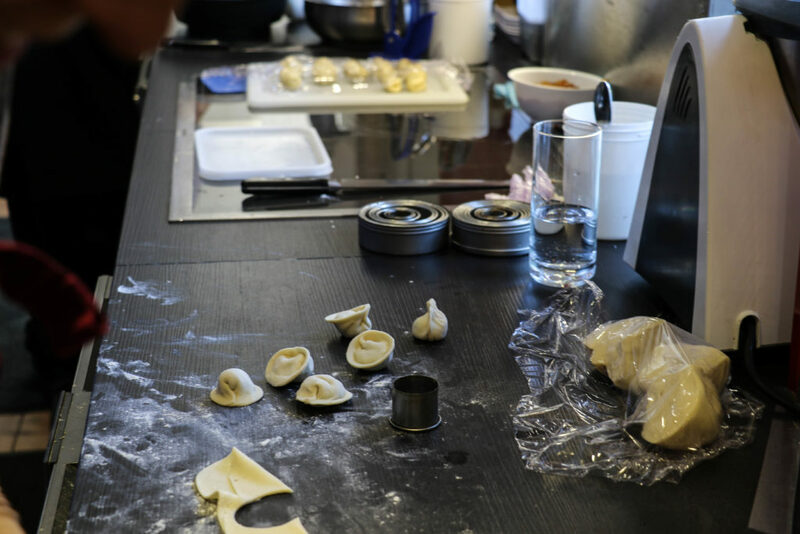 Taking us through what we would be making in our masterclass – a morning dedicated to Asian-inspired delights – Claire and I shifted uncomfortably. What were we – two travel bloggers – doing here? Not only were our culinary skills lacking, but we had previously proven ourselves to be terrible food bloggers: eating entire meals before remembering to photograph it. 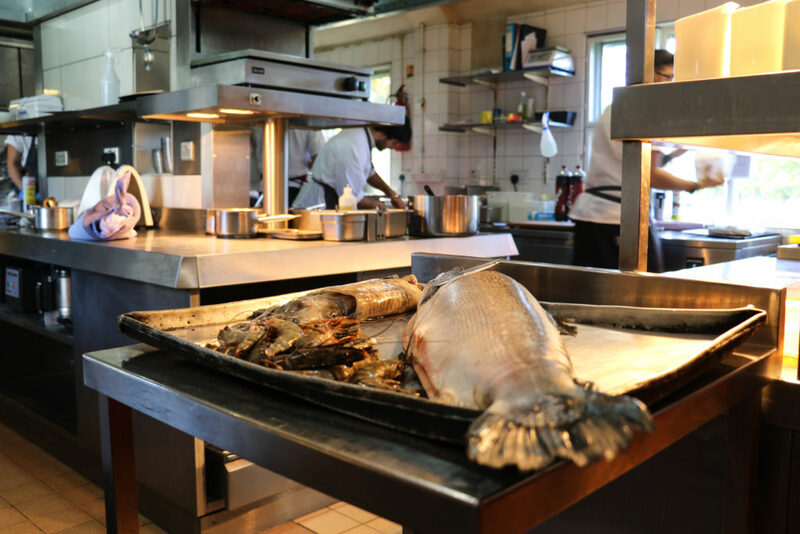 However, as we walked into Paris House’s bustling kitchen, our minds were immediately put at ease. This wasn’t a clinically clean kitchen with arrogant chefs, or someone barking expletives at us. 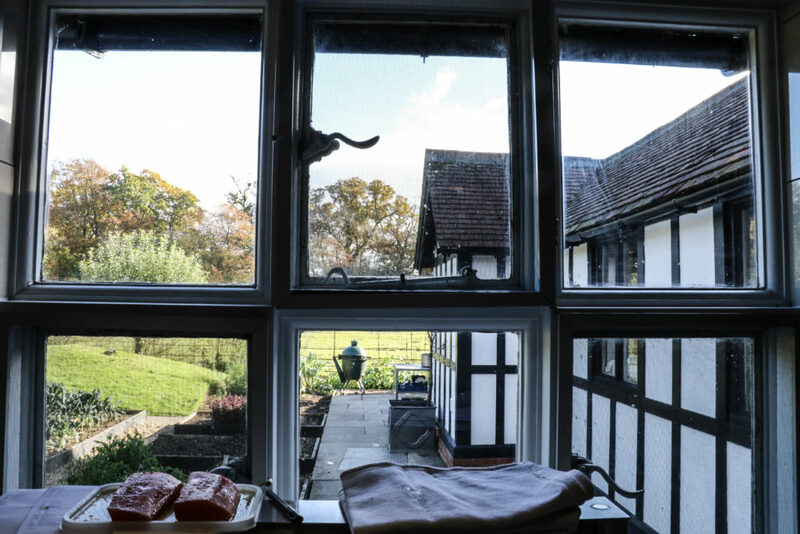 Instead, the kitchen was warm and friendly, with views out over the sunshine-filled vegetable and herb garden. Donning our special Paris House aprons and beginning to feel more confident about the whole thing, Phil then showed us what we’d be making. Our confidence levels plummeted. In front of us was an entire, sad looking cuttlefish (I immediately thought it was an unusually small octopus), an enormous salmon and a pile of fresh prawns. Phil explained that throughout the morning we would be making fresh Salmon sashimi; steamed and fried gyoza and soft pork rolls. Somehow, the lonely cuttlefish and gang of prawns would incorporate themselves into this Asian-inspired feast, alongside pork, bacon and plenty of mustard wasabi. Thankfully, Phil sensed our ineptness and started us on something easy: chopping the many herbs required for the dishes. Sadly for us, and for Phil, even this proved difficult. Claire struggled to chop anything smaller than her hand and I wasn’t sure how to measure water in anything other than a measuring jug. Next to us, our more experienced chef friends gutted the cuttlefish (it was all very Edward Scissor Hands: there was a lot of black ink everywhere), created the delicate dough for the buns and honed a smooth paste from the prawns. I managed to present them with a pile of badly cut coriander, whilst Claire mistakenly handed them some lemon grass when asked for a spring onion. Despite proving tragically bad at cooking, the morning was brilliant – not least due to Phil, who made the whole thing fun. A highlight included watching him dissect the salmon in preparation for the sashimi. 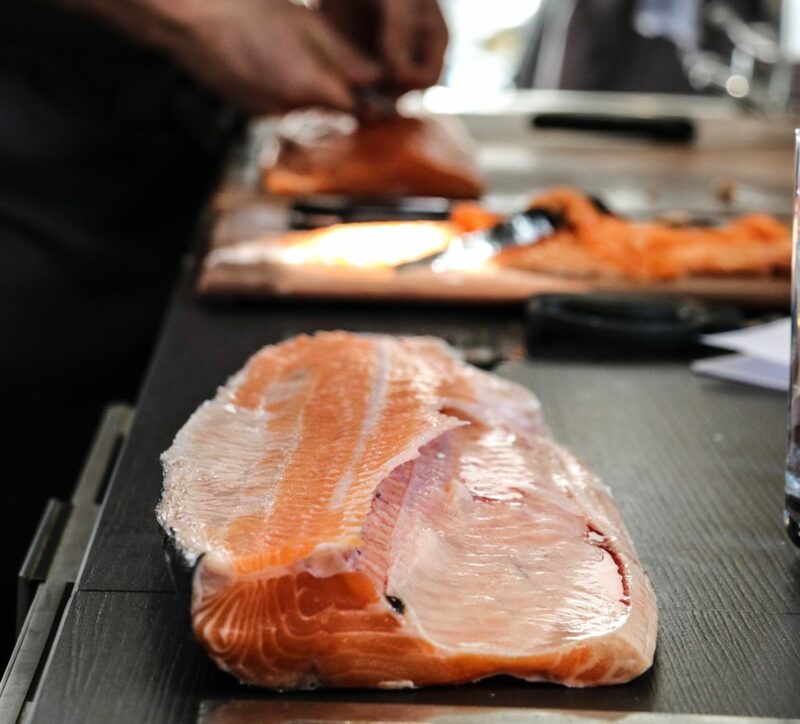 The man is something of a ninja with his Japanese sashimi knife; taking apart the salmon with unbelievable skill. It was strangely mesmerising. Additionally, the sashimi tasted incredible. The last time we tried this dish was in Tokyo aged 18, when Claire promptly gagged and I had to force the fish down with a pint of water. This time, however, there was no retching – just a greedy hope that there might be more to go around. 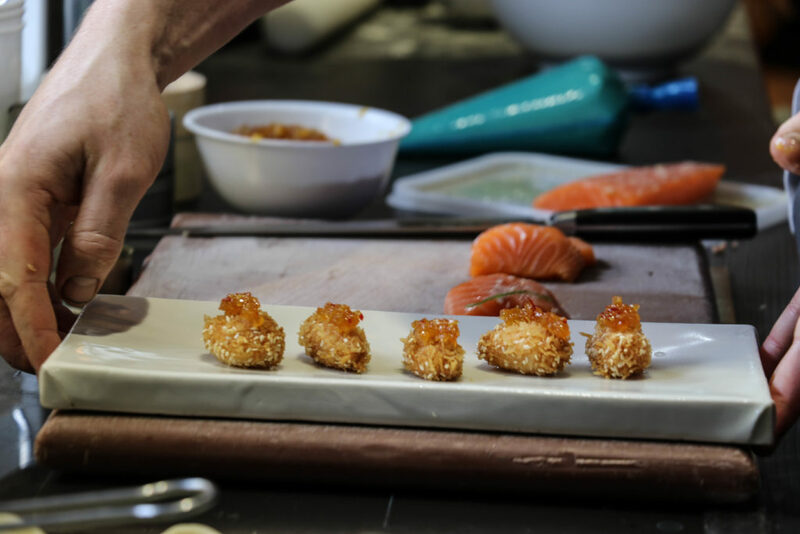 Having steamed, fried, cooked and eaten our various Japanese delights, it was time to rest with a glass of champagne, whilst we waited for our six course tasting extravaganza. We were welcomed back into the kitchen (now miraculously spotless) and seated at the chef’s table, immediately in front of the kitchen. 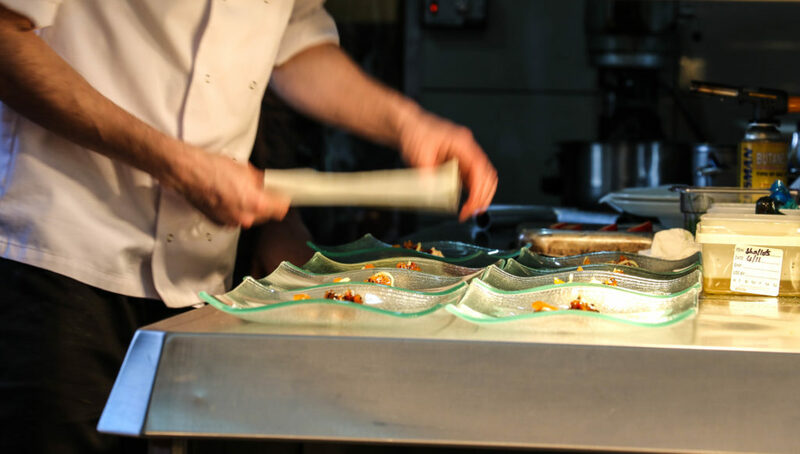 Here we had a behind-the-scenes view of the many chefs busy at work in their various guises: cutting vegetables into many different shapes; dissecting a dizzying array of meats; stirring mouth-watering sauces; and creating incredible deserts, all whilst happily talking and receiving orders. It was fascinating to watch and I was filled with a new appreciation of just how much care and attention is given to each and every dish. 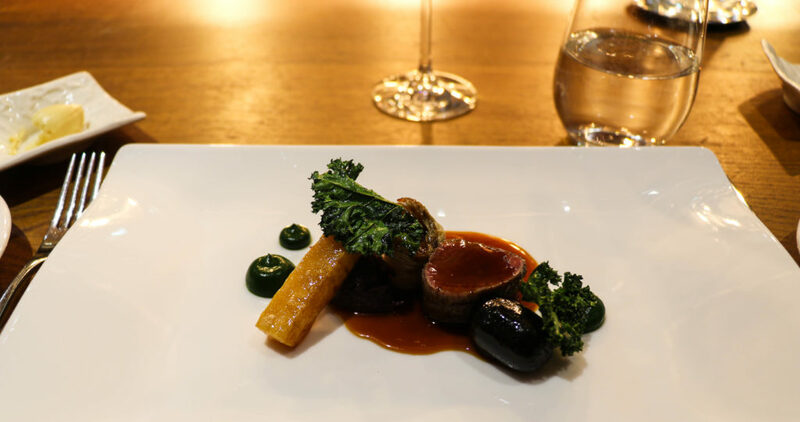 Phil and his team were clearly passionate about not only the flavours of their food, but its presentation. The next two hours was a blur of incredible flavours and food, each course as honestly delicious as the next. 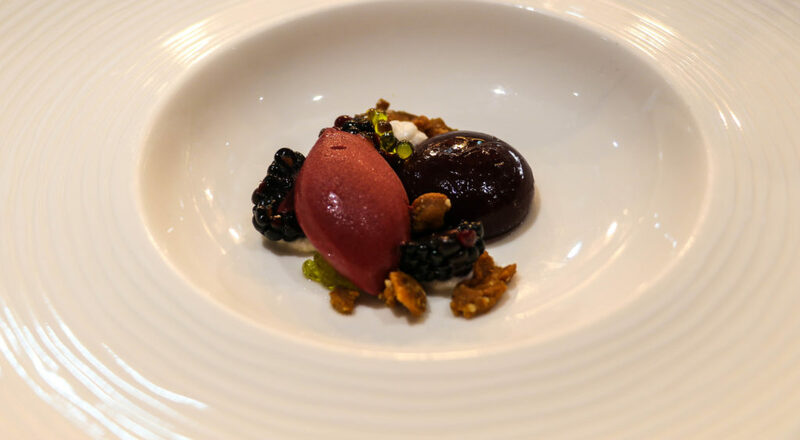 We sampled grilled octopus; Indian-inspired halibut; venison with beetroot licorice; braised pork; oxtail with crispy sage; a twist on the traditional French ‘pot au feu’ dish; Muscovy duck; blackberries with olive oil and a mushroom inspired mousse. I was truly blown away by the combination of flavours and the presentation of each dish; even down to the smallest of flowers sprinkled across our desert. I was also incredibly full. After thanking Phil and the rest of the team for their heroic efforts, I walked out feeling not only a few pounds heavier, but as though I had gleaned a greater understanding of cookery and all things gastronomical. I could tell people how best to chop coriander, what cuts of a salmon you should use for sashimi and how to measure water without a measuring jug. Such knowledge! I felt like Gordon Ramsey, or even better – Paris House’s own Phil Fanning. After one final cup of tea, it was time to wrap up warm against the now pelting hail and sleet that had arrived unannounced. Running to the car, I looked back at Paris House, with its lead -lined windows glowing in the soft light, and its carved wooden arches dripping in the rain. I could understand why Francis had fallen in love with this building; bringing a piece of Hansel and Gretal charm to this otherwise quintessentially English countryside. Today, this little taste of Paris is bringing beautiful cuisine and gastronomical delights to its many diners; a veritable Francophile now well at home its new surroundings of leafy Bedfordshire. Francis would have been proud. In the meantime, if you fancy visiting Paris House for your own lovely dinner, be sure to quote ‘TWINS’ when booking, for a free glass of champagne. The offer runs on bookings made between now and Christmas, and will apply to tables booked up until March 2017. *The masterclass can be chosen by the winner and is valid throughout 2017. Let us know if you’ll be entering in the comments below – good luck! "A Luxury Stay at The Landmark London"
"The best Black Friday travel deals for 2016"
I have entered. The Cookery course looked amazing, great prize ladies! What an interesting place! And beautiful! So beautiful and the grounds are just amazing! Oh that food is making me very hungry! I’ve entered – looks amazing! I had no idea it was so near to Milton Keynes! Ah, fingers crossed for you Sheila – good luck! This looks amazing; I’ve entered and I’m sure my sister will too! Ha! I’m on the case Kath. Thank you! Love it here, always try to go on special occasions! I’ve entered! Hello! I’ve entered too – absolutely love cooking classes, and Paris House looks and sounds absolutely gorgeous! Ah, yes sorry Barbara – this competition ended at the end of November!